One Thing Leads to Another | Tennessee Aircraft Services, Inc. Some time ago, one of my mechanics was watching the main gear retraction cycle on a 210 (a round gear version). He noticed the main gear support saddle block moved just a little as the gear leg seated in the down and locked position. 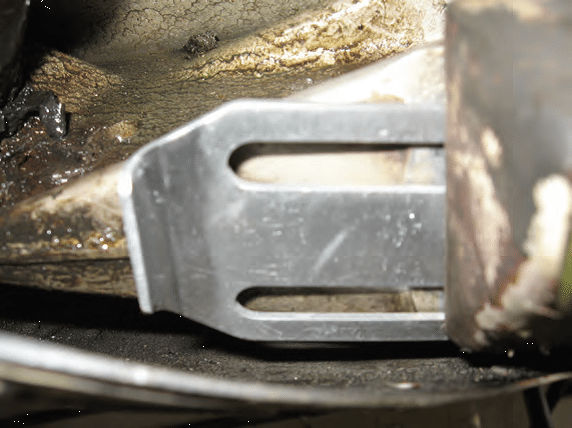 Further investigation revealed the 4 bolts that hold the block in position were loose. After that excellent find, he now looks for it on every round gear retractable Cessna that comes through the shop. Recently, the same mechanic noticed the left gear support loose on another plane in for annual inspection. This time he also picked up on the fact that the right gear support had a shim installed but the left did not. Time to hit the books. 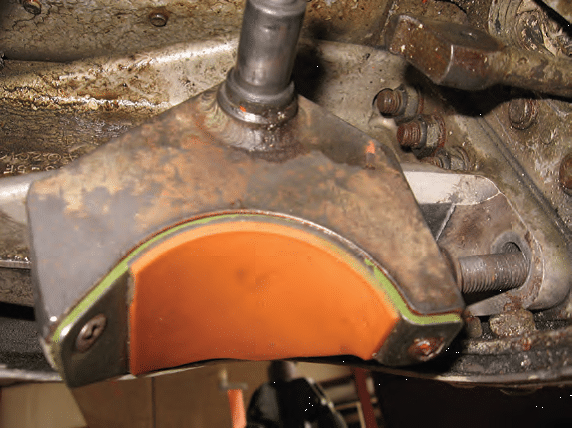 the orange pad where the round gear leg fits. The Cessna 210 Series Service Manual (Rev 5) Section 5 paragraph 5-291a describes the first steps in rigging the landing gear. 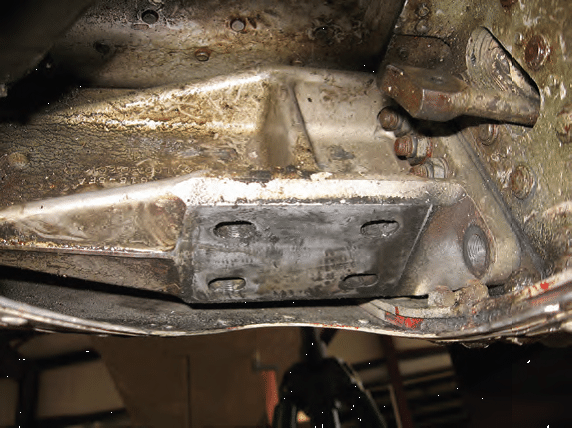 It starts with setting the height of the gear legs by installing shims under the main gear support. The minimum allowed shim thickness is 0.025”. Figure 5-48 has 4 sheets and shows these parts in more detail. Item #10 is the shim(s) and the support block is item #3. None of this is new to the fleet, but it is a new issue to the relatively new mechanic. It’s now also a newly discovered issue for the owner of the plane. This “new” issue led to yet another maintenance procedure that this mechanic had not performed before; leveling the gear legs. Now another procedure is added to our simple bolt torque problem. It just keeps getting deeper. The process is pretty simple; measure the distance from some point under the wing to a given point on the gear leg and see if the left and right are within 1/4”. It really doesn’t matter what point is used under the wing as long as it is precisely repeatable on both sides. For the gear leg end, using a point as far out from the cabin as practical will yield better precision. We had the wing fairings removed so we used the lower wing attachment as the reference points and the top ankle bone attach bolt on the gear end. Just one small note; these measurements are only useful when performed with the plane on jacks and the landing gear held securely in the down position by hydraulic pressure. In our case, the difference between the right gear and the left was just over 1/2” with an unknown shim on the right support and no shim on the left. Cessna sells shims in thicknesses of 0.016”, 0.025”, 0.050”, and 0.071 with the maximum allowed combined installed thickness of 0.075”. Adding a shim lowers the support block which in turn lowers the gear leg which ultimately makes the wing on that side of the plane higher off the ground with the plane is on its wheels. We installed a 0.025” shim first and got the difference down to 1/4”, within tolerance but why not get it closer while we’re there? We installed a 0.071” shim and got the difference down to just under 1/8”. That’s as close as we can get without taking the other support block off. Now that we’ve changed the down position of the gear leg we have to adjust the down lock engagement as well. Knowing this would be important; Cessna thoughtfully included that procedure as the very next steps in the service manual. A few gear swings to ensure all is working well and back down on her feet she goes. A 3/8” change at the left wheel should make a noticeable height change at the wing tips. 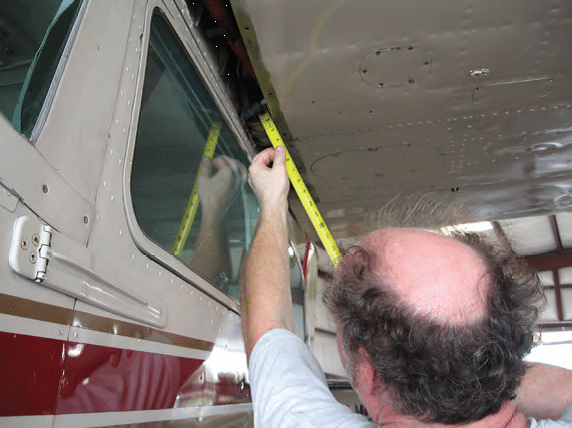 Taking a measurement from the lower wing attach pin retaining bolt. There are several lessons one could take away from this event. First – detailed knowledge of the make and model is very helpful. Someone new to this type might not have understood the importance of watching all the different points of interest on the landing gear. Second – an eye for detail and the ability to focus ones attention is required for a good inspection. Even without being model specific knowledgeable, an alert non assuming inspector can still find the important stuff. Third – access to, and usage of, the proper service manual is not only needed but required by FAR. Without consulting the service manual none of the required maintenance procedures and limitations would have been followed. In this case, a very real possibility of the down lock not engaging properly was averted.